A old book, previously unnoticed, has been discovered by Thormac the Sorceror. 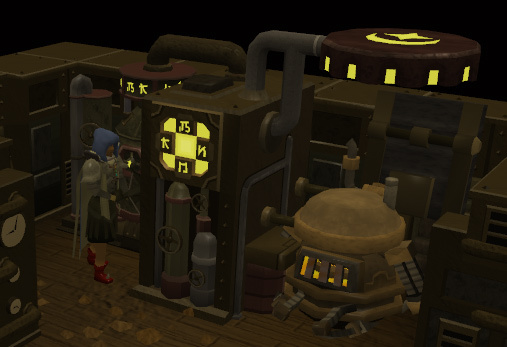 Since it has to do with the Elemental Workshop, he thinks you might be interested in reading it! 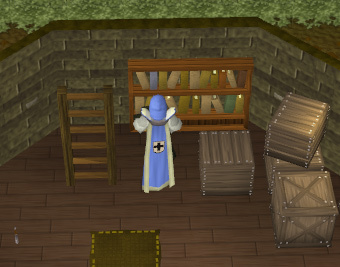 Search the bookcase on the ground floor of the Sorcerer's Tower south of Seer's Village. Search the bookcase on the ground floor of the Sorcerer's Tower. You'll find a Notched Book which will start the quest. After you read it, go to the building next to the bank in Seer's Village, and use a Knife on the whetstone to create a Keyblade. Next, go to the bottom floor of the workshop and use the Keyblade on the locked door. 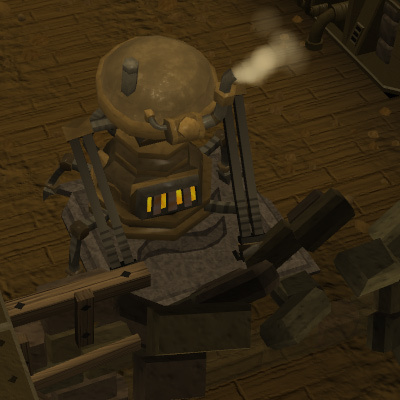 You'll find a few new rooms within this new area of the workshop. Start off by opening the Cosmic Door. Head over to the South-Eastern part of the room, and operate the control panel. On the west and north side of the room are rune emitters. They hold one type of rune, which you can switch out, and when you operate the control panel you can have it shoot out a blast from the rune. You need to have the color of the pillars match up along with the emitter to blast the rune type through to the other side. Each pillar allows different types of runes to go through, such as fire/air, and water/earth. You may rotate the pillars through operating the control panel. When you have everything set up, power up the control panel to shoot the runes. 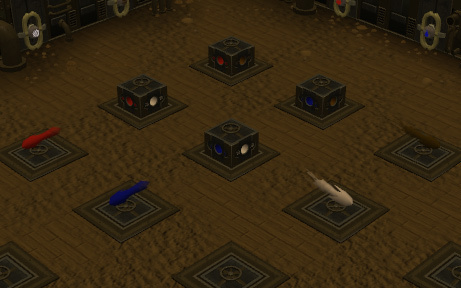 If the puzzle is set up correctly, the runes will shoot through the pillars, and then set up the next puzzle. There will be three puzzles to solve. The first will be 2x2, the second will be 3x3, and the third will be 4x4. The best way to solve the puzzle is to just solve each line at a time, and adjust the emitters to complete the puzzle. Once you've solved all the puzzles, the cosmic machine will power up. Operate the Draining Machine, which will trigger a cut scene. Davi the Automaton will go and open up the Chaos Door. Before proceeding into the Chaos Room, use a primed bar on the machine, and then operate the Draining Machine to receive a Cosmic Bar (if you need to make a Primed Bar, refer to the Elemental Workshop II quest guide). Now go back to the top level of the workshop, and use the Cosmic Bar on an anvil to create a pair of Cosmic Gloves, you will need these later. 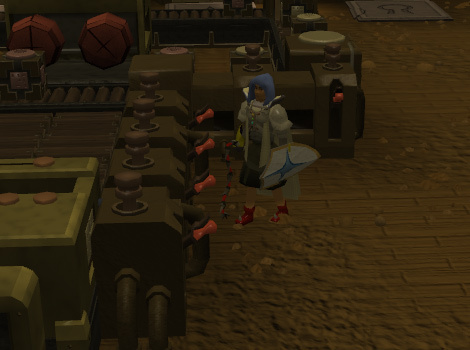 Note: making Cosmic Bars from Primed Bars drains your Runecrafting skill. Head to the west side of the Chaos Room and pick up the Shabby Book. After you read it, go to the South-Eastern side of the room to the levers. The four levers lined up will operate the conveyor belt (the one to the very north will move the conveyor belt clockwise 5 times, the next one moves it 1 time clockwise, then 1 step counterclockwise, then 5 steps counterclockwise) and the two lined up levers will operate the RAM. For this puzzle you will have to operate the Automaton. To operate him you move the blocks onto the conveyor belt in front of the RAM then have them pushed into the CPU to give orders to the Automaton. You can give the orders give, put, break and operate. 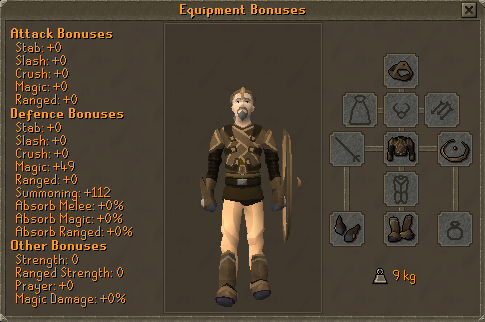 Place a Primed Bar on the machine, and then operate it to receive a Chaos Bar. 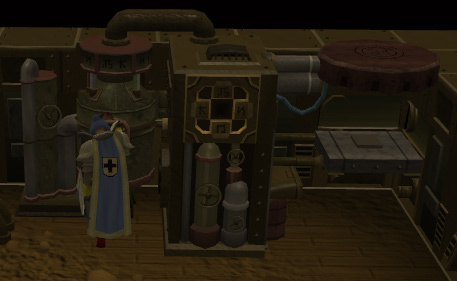 Take the Chaos Bar upstairs to an anvil and make some Chaos Boots. Note: Making Chaos Bars from Primed Bars drains your thieving skill. 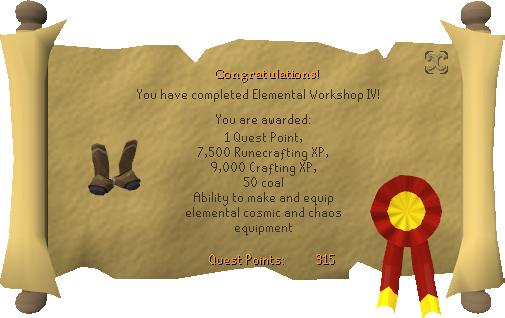 7,500 Runecrafting experience 9,000 Crafting experience 50 Coal Ability to make and equip elemental cosmic and chaos equipment. 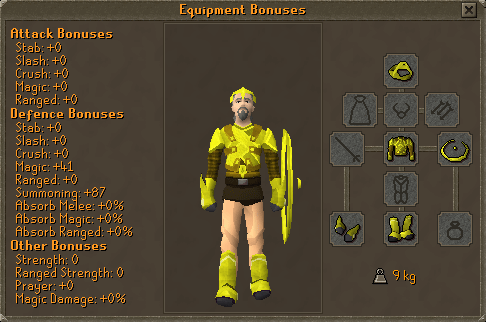 If you intend to make a full set of Cosmic/Chaos equipment, you will need 4 or 5 doses of Super Restore Potions per set and 6 bars.